I fell hard and fast for persimmons right around this time last year. The girls and I were visiting Todd and Diane, and there was a tree dripping with ripe, deep orange orbs. I mentioned to Diane that I bet they’d make an incredible cake, and she told me to help myself. With a sparkle in my eye, I looked at her and asked “are you serious”? I had no tried and true persimmon cake recipe in mind. This was a recipe development itch I’d be scratching, and didn’t want to feel as though I was wasting any of their bounty. Incidentally, Diane and Todd just came out with a new cookbook, aptly titled Bountiful, and this is a book you want to own. The photography is incredible, the stories they share are touching, and the recipes, well, they make Bountiful a win-win-win for me. But back to this persimmon obsession that started to grow in their garden last fall. When I set out to develop recipes, I let the ingredients around guide me, and I’m not afraid to change gears if an inspiring idea pops into my mind during the process. Three versions later, what emerged was a buttery cake, dotted with chunks of persimmon, and topped with a generous layer of cocoa-streusel crumb. The recipe is one that I’ve been saving for the next book, which you’ll all hopefully be reading around this time next fall. Memories of that cake crept into my mind as I began to think about what I wanted to make to celebrate Food Network’s Fall Fest this week. The ingredient is carrots, and my initial instinct was to share a most incredible carrot salad recipe inspired by my trips to Paris. In fact, this last trip is the first time I didn’t stop by Le Petit Vatel for dinner to eat that salad. I could devour a never-ending plate of it, and not get bored. I promise, sharing that recipe is still on my list of things to do. I was in a cake baking mood for Fall Fest, but the inspiration for what to make exactly took some coaxing. Muffins crossed my mind, but I didn’t want to feel limited to just a breakfast dish. I thought about cupcakes, a quickbread, and carrot-potato latkes, but nothing stuck. That persimmon cake from last fall was trying to tell me something. It was time for persimmons and carrots to have a kitchen playdate. Finding good, juicy, super ripe persimmons is challenging when you don’t have a tree in your backyard. I’ve never seen it at any of my farmers’ markets, and the ones sold at grocery stores tend to be pretty rock hard. Patience has never been my strong suit, so waiting a few days for the persimmons to hopefully ripen was not an option. After digging through a bunch at the fruit stand a few blocks from my house, I managed to unearth a couple that were so ripe, the flesh easily shed its skin with my fingertips. 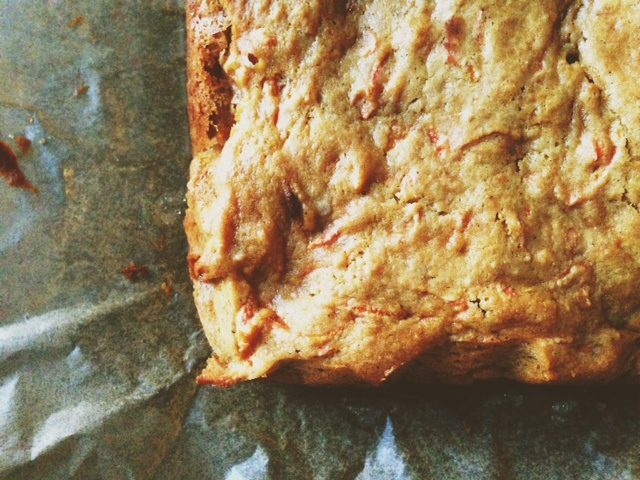 Those are the kind of persimmons you want to buy to make this cake. They will add extra moistness to the batter, and the chunks will sort of melt into the cake, creating pockets of persimmon butter with each bite. My lust for persimmons may have distracted me a bit, but I didn’t forget about the carrots. The cake is laced throughout with shredded carrot, and scented with my homemade chai masala blend. The result is a cake that transitions seamlessly from breakfast, to snack, to even dessert. I’m offering it up here today without a frosting or finish. I love eating this just the way it is, after it’s cooled completely. You can dust it with confectioners’ sugar for a modest dessert, or go the whole nine yards and slather on a layer of cream cheese frosting. 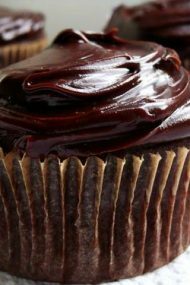 I’ll admit I was dangerously close to making a fudgy chocolate cream cheese frosting for it. Something about those persimmons makes me think that would be a match made in heaven. M and I were kind of like those carrots and persimmons. Two ingredients you’d never think of pairing, yet they worked beautifully together. Sometimes fate brings us down a road we never expected, and we have to keep our minds and hearts open to see the real purpose. 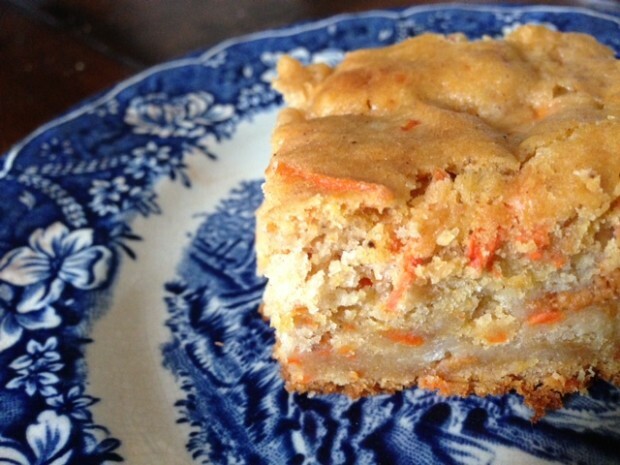 This recipe is unlike any other carrot cake. 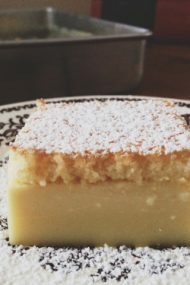 For starters, it’s made with a classic cake-making technique of creaming butter and sugar. Most carrot cake recipes use oil as the fat, which in my opinion makes for a heavy cake. There are also no raisins—add them if you like, but I’m not a fan of raisins in my cakes. I totally intend to add some chopped walnuts the next time I make it, too. I think a 1/2 cup chopped would be a nice addition. Preheat the oven to 350F. Line an 8-inch square baking pan with parchment paper. You can alternatively grease the bottoms and sides with butter; I was just feeling a little lazy tired. Add the flour, fleur de sel, baking powder and chai masala to a medium bowl. Whisk to combine; set aside. 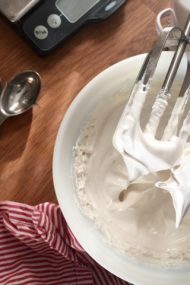 Add the butter and sugar to a deep bowl, and beat on high using a hand or stand mixer, until light and creamy. Add the egg and vanilla. Beat until well mixed and fluffy, 1 to 2 minutes. Pour in the flour mixture and the milk. Turn the mixer on to its lowest speed, and mix until just combined. Beat on high for 1 more minute. Use a rubber spatula to fold in the carrots and persimmon. The batter will loosen up a bit from the juice in the persimmons, but it will still be a relatively thick batter, so don’t worry. Spoon the batter into the prepared pan, and spread it to the edges. Bake 50 to 55 minutes until the cake is a deep golden color, and a metal skewer inserted in the center comes out clean. Transfer the pan to a wire rack, and let cool completely before serving, or frosting, if desired. Here’s some more carrot inspiration from everyone sharing recipes on Food Network’s Fall Fest this week. You can also follow the Fall Fest fun on Pinterest. B. This is a shot in the dark but do you have any cook/bake ware recommendations for a group home of about 10-15? (I work with young girls who have experienced trauma and our cooking program is huge with them- we are on the hunt for good quality-durable products that work well for such a large group)…any suggestions? These days I buy a lot of my bakeware from thrift shops and garage sales. I figure that’s proof alone of their sturdiness, and longevity. I imagine scouring markets may not be feasible, though, and would recommend Baker’s Secret or Wilton if you have a limited budget. Are you on Twitter? I know Wilton is on there. Have you considered asking them for a donation of bakeware? I’ll think if they are other companies I know of that may be able to assist you. Jennie, I love the way you are processing things, and continue to have the courage to share. What a wonderful world this would be if others good do the same. All best .. . .
Hey, I missed this post! Wishing you timeliness, thrift store finds and bargains galore and a whole lot of sunshine!